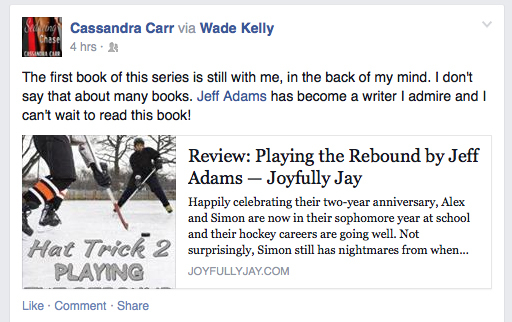 “Hat Trick 2” Blog Tour Wraps Up, First Reviews Are 5-Star! 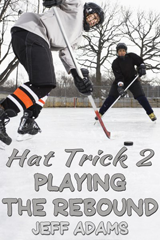 Hat Trick 2: Playing the Rebound is available now at JMS Books, Amazon.com and other retailers. I’m over at Prism Book Alliance talking about HT2 and GayRomLit, which is coming up in October. I love going to GRL and this is the first year I’ll be there as an author and it’s going to be a blast. Besides an exclusive excerpt, I’ve also got a copy of either HT or HT2 in ebook format for a lucky commenter. In case you missed any of the tour stops, you can see them listed at the bottom of the post. Thanks, Cassandra. It means a lot to know that I’ve left an impression. I hope I live up to it when you read HT2. And, as promised, for anyone who missed it, here’s the full tour stop itinerary with links.